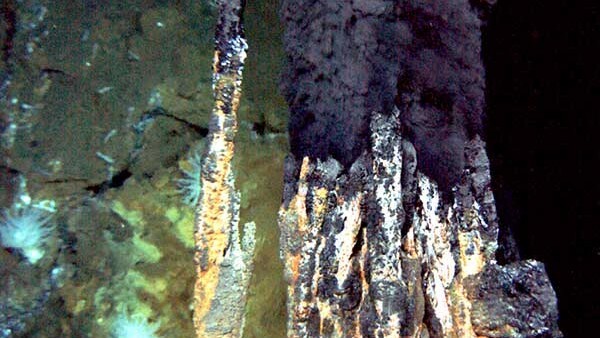 About this image: Hydrothermal vents on the seafloor, such as Piccard vent field on the Mid-Cayman Rise, play host to ecosystems of diverse bacterial and archaeal species thriving on chemical energy derived from water-rock reactions. Credit: WHOI Deep Submergence and Chris German. Read more about research on these vents from Deep Life's Julie Huber and colleagues here. A DCO sponsored film produced by Sur une île was selected for screening at the 2016 EGU General Assembly in Vienna, Austria. Lake Dziani Dzaha presents an unusual combination of characteristics making it a likely analog for some hydrocarbon-bearing lacustrine rocks of economic importance and possibly certain Precambrian environments, including expanding rift valleys and basins. A dense population of prokaryotes and cyanobacteria dominates the Dziani Dzaha ecosystem—giving it a permanently green color. Its waters are saline (twice ocean salinity), alkaline (pH = 9), extremely rich in dissolved inorganic carbon (100 times the amount in seawater), and anoxic below one-meter depth. It also precipitates microbialites, which are organo-sedimentary deposits that accrete as a result of a lake-bottom microbial community, forming the locus for mineral precipitation. View the documentary at EGU 2016 in room 0.90 at 2:00pm Tuesday, 19 April, 4:30pm Thursday, 21 April 2016, or on the DCO website here. 23 March 2016: Home Sweet Villarrica! Driving to Villarrica felt like coming home. A few years back, several TBF members spent a month there studying the behavior of its lava lake. Back then, they faced a series of storms and found themselves working under the snow and digging out instruments from piles of ice every other morning. Katrina Twing (University of Utah, USA) will deliver a live, online presentation titled "Microbial diversity and metabolic potential of the serpentinite subsurface environment." Tobias Fischer (University of New Mexico, USA) will deliver a public lecture on what active volcanoes tell us about Earth's interior, live streamed and archived here. Following the two very successful International Diamond Schools held at Padua, the DCO Diamonds and Mantle Geodynamics of Carbon Consortium will host a 3 day International Diamond School in 2016 on Diamonds and their cratonic mantle hosts at the University of Alberta. Initial expressions of interest can be sent to Graham Pearson. An eighteen-­month postdoctoral fellowship is available in Lyon (France) at the Laboratoire de Géologie de Lyon, France, for modeling abiotic hydrogen and methane production at the local and global scale. The fellowship is supported by the Deep Carbon Observatory. The successful applicant will establish local and global budgets of H2 and CH4, based on data mining in the literature and new experimental data to be acquired during the postdoc. The resulting thermodynamic models will be coupled with the state­‐of‐the‐art geodynamic models of the lithosphere. He/she will be part of a very dynamic and interdisciplinary team with complementary expertise in experimental petrology and geochemistry and in geodynamic modeling (Augury team). To apply, please submit a single PDF document to Isabelle Daniel incorporating the following: a cover letter, contact information for two references, curriculum vitae with a publication list, and a statement of past research accomplishments and future research goals (two pages or less). Complete applications will be reviewed as they arrive until the position is filled. The Deep Biosphere laboratory at the Bigelow Laboratory for Ocean Sciences is seeking a qualified and highly motivated individual for a full-time or part-time Research Technician position. Highly successful candidates would have experience with environmental science and/or microbiology, with working knowledge of molecular biology techniques (such as DNA extraction, amplification, sequencing, bioinformatics) and/or microscopy considered as highly desirable. Experience with project management also desired. Proficiency in computer programs for word processing and data entry and good communication skills a must. Applicant must have at minimum a B.S. degree. Research will be conducted primarily at the Bigelow Laboratory for Ocean Sciences in East Boothbay, Maine, but opportunities may be available for fieldwork. The position is initially offered for one year with continuation for additional years based upon successful job performance. The position is available immediately, but this may be negotiated. Salary will be commensurate with prior experience. Review of applicants will begin on 11 April 2016. The International Ocean Discovery Program (IODP) at Texas A&M University invites applications for an Assistant Research Scientist (Expedition Project Manager/Staff Scientist) in the Science Operations section. Preference will be given to applicants with expertise in petrology, inorganic (fluid) geochemistry, downhole logging, petrophysics, and sedimentology. However, applicants in any field of geoscience pertinent to IODP will be considered. A Ph.D. in geosciences or related field, and demonstrated on-going research experience is required. Experience as a seagoing scientist, especially in scientific ocean drilling, is preferred. This position will serve as the Expedition Project Manager to coordinate all aspects of precruise expedition planning, sea-going implementation, and postcruise activities. These duties include sailing as the IODP scientific representative on a two-month IODP expedition approximately once every 1 to 2 years. Individual scientific research, as well as collaboration with colleagues at Texas A&M University in fulfilling its educational mission, is required. This position will also provide scientific advice on laboratory developments in their area of specialization including scientific implementation of downhole logging on the JOIDES Resolution. Application review will begin 16 May 2016, but application consideration will continue until candidates are selected for interviews. 23 March 2016: What the Heck is a Diamond Anvil Cell? In the Extreme Physics and Chemistry (EPC) community, our main goal is to learn about the structure, properties, and behavior of carbon-bearing materials at the extreme temperature and pressure conditions in the interior of Earth and other planetary bodies. Scientists have performed experiments at elevated temperatures for centuries, as there are many methods available for achieving high temperature. Attaining high pressure conditions in the laboratory, however, has historically proved much more problematic. There’s a lot more carbon stored inside the Earth, where it benignly remains for millions of years, than there is overloading the atmosphere. But because of the discrepancy in immediate human impact, all we ever hear about are the deadly consequences of the stuff above ground as it accumulates in carbon dioxide molecules and amplifies climate change. More than 5,000 minerals have been identified on Earth, more than half of which are classified as rare, meaning they’ve been found in five or fewer places on the planet. Robert Hazen and Jesse Ausubel recently catalogued these rare minerals for the first time. Some are so rare that the cumulative volume of all known samples is less than a cubic centimeter. On Sunday the 6th March 2016 the people of Scotland and northern England witnessed a beautiful natural phenomenon in the night sky, the Aurora Borealis. Living in Fife (colloquially known as the Kingdom of Fife) in Scotland, I was one of the lucky ones.